The Faculty of Nursing cultivates human resources that can contribute to society by the creative practice of nursing from the perspective of love for mankind and understanding of different cultures, with reverence toward rich humanity and life. Students acquire the ability to practice “Nursing by the Side of the Patient”, by transcending the differences of race, religion, culture and even generations, perceiving them as different cultures. 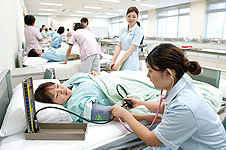 The curriculum of the Nursing Department covers a broad range of specializations from International to Disaster Nursing, and aims to train nurses who can put the concept of "Nursing by the Side of the Patient" into practice in a variety of situations. 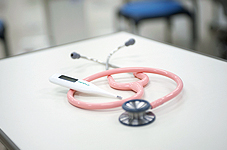 The carefully-structured curriculum enables students to become eligible to sit three National Qualification Examinations: for General Nurses, Public Health Nurses, and Midwives.